If you hadn’t told us what that white object was under your arm, I’d-a never guessed! Hokey-smoke! How does HE do in the hot?! Good on you–another week for your own self and then back to a much less stressful job (I certainly hope!). Take good care and *don’t rush*! I know! He’s whiter than milk. I took him to Florida and SC and slathered him in sunscreen. I can NOT imagine how bad he would burn! Dr office assistant said, in her New Zealand accent, ‘they’ll be fine without you for another week, dear!’ Thank you thank you! Love the dr assistant! And it’s (horribly) true that we’re dispensable! But I give thanks for that–I never want again to feel indispensable! Yep, I’m not that. Even though I was the ONLY person who knew what I did and how I did it in a day – it only took about 2 hours over 2 days (via phone) to explain to my fill-in. She HATES IT. I can’t imagine why. hahahahahha! I had to be told too what the white thing was! Oh please, don’t like hip-hop. I’ll like you so much better knowing you can sneer and/or deride it like I do! 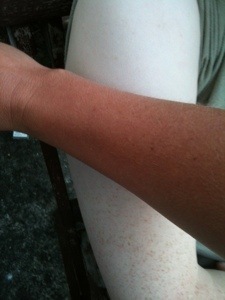 Yep, I have the whitest man ever, in my his-tory (pun intended) of men. His eyelashes are blonde! It’s still a bit startling for me even after 8 years of marriage. LOL Don’t worry there is little chance I begin liking hip-hop! Would he be albinos, or just happen to be really pale? Sleeping in hammocks always sounds so comfy…but that sagging after a while! Gosh darn. You have to stay out another week. Oh, pooh. Hope they are beginning to appreciate what you did. And the feeling of steel toed power ahead – or a-toed. My dad had that freckled arm with farmer sleeve line – when growing up we went to the beach about 2 times: once the tops of his feet sunburned so bad he couldn’t wear shoes. That was it. Mountains, but no beaches. Seriously pale. My daughter inherited pale from her dad’s side, too and a pale hint of red hair. I grew up on the Gulf coast, so we took our vacations in the mountains! I loved it, of course. I’ve done the burned foot thing, that really smarts! Brown like a berry! My mother always said that about me, I had no idea it was an international turn of phrase 🙂 I made my hub coat himself in SPF 40 to go and take pics for 20 minutes. He got more freckles anyhow. I guess that beats a blonde Irishman! It depends on the albino, and the Irishman. Awesome you slept outside for a while! SG1 is among my favorite shows, but yes there were a few bad episodes. I suppose they had to spare some budget on some episodes so they could do all these amazing ones. I catch it from time to time, I never get bored of it. Too bad the other Stargate series never worked as well as this one. I’ve never given it much time, but the one I saw was pretty lame. We’re working our way through Voyager now, and I fall asleep to quite a few of them. Then again, I can’t seem to find many TV shows I want to stay awake through.